Sparkly painting 2013, a photo by Jason Dryg on Flickr. Here is a new painting for my first ever solo show in June 2013. 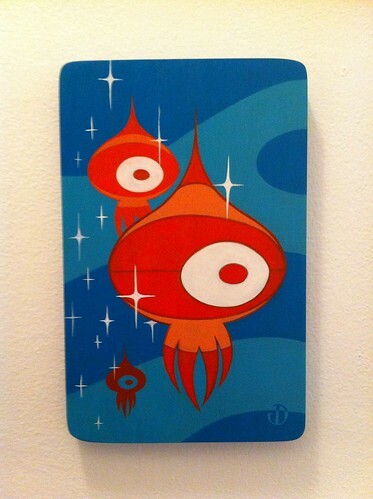 It is an acrylic painting on wood, based on my signature squid/alien characters. They started as digital pieces that I wanted to make more solid and real. It is a wierd transition going from digital to traditional. I really had to let go of the control and exactness that digital allows. That said, I think it came out pretty good. My first solo show, ever!